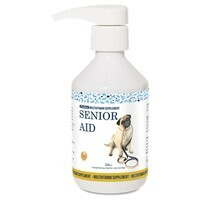 Senior Aid Ageing Multivitamin Supplement contain a full complement of vitamins and minerals to ensure optimum health and brain ageing in older dogs and cats. Senior Aid has been scientifically formulated with key ingredients that each play their own individual role in helping to slow the ageing process. Our 2 labs (15 and 11 years old) have been receiving this product, and I'm sure it has helped them a lot to keep in good health. Minerals, Vitamins - everything an ageing pet needs much more than a younger one!